It's coming up Chromebooks this week as Acer is out with details on its latest Chrome OS-based laptop just days after HP lifted the lid on the Chromebook 11. Wind of the C720 first started blowing during IDF 2013, but details for the device were scarce, save for news that Haswell was humming along inside. Now, the silver-tinted picture is much clearer. First, about that Haswell - specifically we're talking a Celeron 2955U processor based on Intel's 4th gen Core processor architecture. Acer is bragging about the C720's battery life, which it claimed lasts up to 8.5 hours. The Taiwanese hardware maker's third-gen Chromebook is apparently 30% slimmer than its predecessor, the C7, measuring 0.75-inches thick and weighing 2.76 pounds. Something else its predecessor didn't have? An anti-glare display, that's what. While we're on the subject of the first-of screen, we're looking at an 11.6-inch HD display brimming with a 1366 x 768 resolution. Its described as housing ComfyView HD tech, a term we've never heard before but one that sounds snug. Like a well worn blanket or a beanbag chair. On the storage side of the things Acer topped the DDR3L memory off at 4GB with a 16GB SSD. This specific configuration belongs to the C720-2800, and it's actually only the start as Acer said more configs are due in the coming weeks. The C270 lays claim to a boot time of less than seven seconds, meaning you won't have to wait the usually unbearable 10 seconds-plus log on. There's an HD webcam built into the C720's top but users can upload photos and videos through either its USB 3.0 or USB 2.0 port. An HDMI slot found a spot on Acer's machine to make a path for videos and other content to reach external displays and HDTVs. Last but not least (well, maybe least) keep an eye out for the C720's SD card reader. You'll probably need it at some point. When it lands, the HP Chromebook 11 will run customers $279 (£229/AU$295). The C720-2800 just edges out HP's offering, coming in at $249.99 (about £156/AU$264). U.S. customers can start pre-ordering the new Chromebook at Amazon.com and BestBuy.com right now, though we're yet to hear a specific ship date. 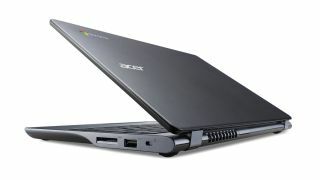 According to Acer, the C720 is headed to Switzerland, Germany, the U.K., France, the Netherlands, Sweden, Finland, India and Taiwan. The top's Google hub page tips that the machine comes packing 100GB of Google Drive free for two years. Gear up for the iPad 5 by checking out our comprehensive hub page.